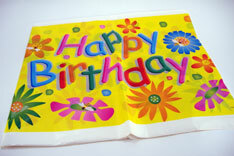 Party themed tablecovers with birthday flower design. Each cover is 54 inches wide by 108 inches long. $1.10 each for 120 or more. $0.99 each for 240 or more.